We hiked into a high camp in Navajo Basin via the Silver Pick trailhead attempting to stay on public land as much as possible. 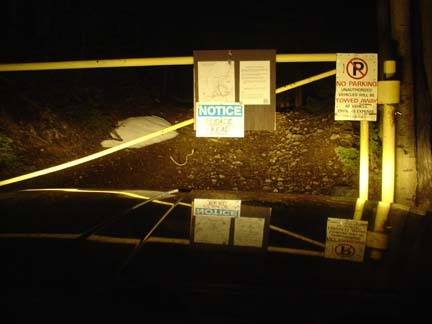 We're not big fans of trespassing or breaking the law so we took a non-intrusive approach hike after midnight and really paid attention to the map from Charlie Fowler's website (see TR for URL) to stay off of the private land. 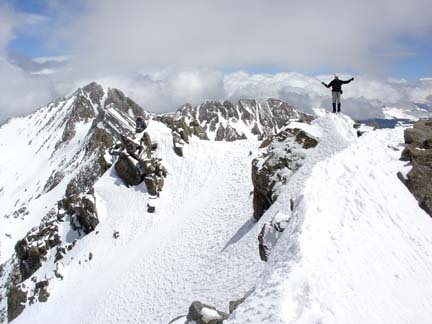 The El Diente to Mount Wilson traverse is one of Colorado's 4 classic 14er Traverses. A June climb of this route would be a good challenge given snow conditions. We had hiked into a high camp at 12,700' feet in Navajo Basin via the Silver Pick basin approach over Rock of Ages saddle. From there we Ascended a snow couloir on El Diente's north slopes and then traversed along the ridge to Mount Wilson. I've always believed in civil disobedience when necessary. That being said, Bill and I arrived at the Silver Pick Basin trailhead at 11:40pm Friday night after our 5 and 1/2 hour drive from Los Alamos. We were able to drive all the way to the closure gate at 10,420' without issue. There were no other vehicles at the trailhead. At the closure gate at the Silver Pick TH. The sky was clear but we had driven through a few rain showers on the way and knew the forecast called for more showers that night and into Saturday. Knowing that, we packed the single-wall tent instead of our bivy sacks as we prepared for the approach. At about midnight, we began our hike into Silver Pick Basin. Hiking in the dark, no moon, is always an interesting experience. As we hiked the dry road we began to encounter sizeable snow drifts spanning the road that were frozen and angled sharply down. We didn't feel like donning crampons so early during the approach so we took our time kicking small steps in the hard snow as we traversed. The light of headlamps left plenty to our imagination as to what lay below us should we slip. Conversely, the light didn't show us just what we'd slide into. Ignorance is bliss. It began to snow lightly and the clouds rolled in giving us poor visibility as to what lay ahead. We were quite sure no one else was up in the basin ahead of us though as the snow drifts weren't at all passable and there were no tracks in the snow. At one point Bill noticed some light to our left and slightly behind us and with the light snow and fog he was unable to discern how far away the light was and was sure someone was right behind us! We both killed our headlamps in a weird kinda paranoia and were able to conclude the light was from a home down in the valley! :) We carried on trying hard to follow the map listed on Charlie Fowler's website showing a way to make this hike legally. We short-cutted the road when we could on hard snow and pressed on until we couldn't avoid trespassing--the crossing of Rock of Ages saddle at 13,020. We intended to camp around 12,700' on the south side of Rock of Ages where we'd hoepfully be "legal". At around 2:40am we finally found a spot at 12,700' on the south side of Rock of Ages saddle that, with a little bit of snow shovel work, was flat enough for a campsite. We setup camp and went to bed at 3:30am in foggy, windy conditions. We awoke at 6am to take a peak outside and saw nothing. Literally. It was a whiteout. The weather was mostly calm with some intermittent light snow showers but we were in the heavy fog on a snow slope. Everything was white. Considering this weather and our mere 2 and 1/2 hours of sleep, we decided to go back to bed until 9:30am-ish and evaluate things at that time. Around 10am we awoke to a somewhat-clearing basin. The cloud deck was hovering around 13,000'. The forecast was for clearing skies and the temperature was still quite cold so we went with it and suited up for the climb. 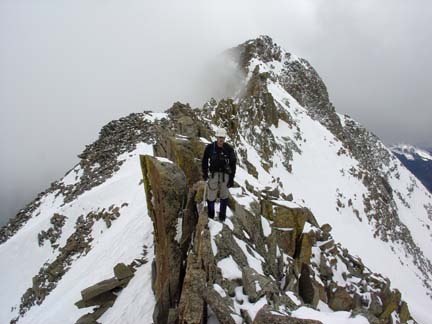 I had climbed Mount Wilson and done the traverse to El Diente in 2002 and was interested in doing the traverse the other way this time. Bill had no qualms with this. 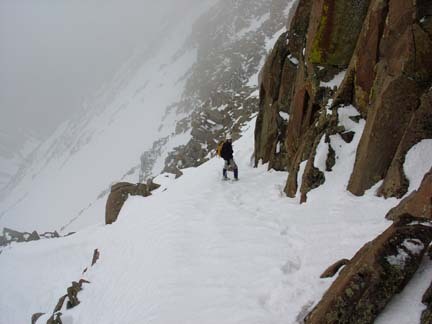 Plus, the snow climb on El Diente's north slopes route looked great. At least up as far as we could see which was around 13,000! We descended from camp down into Navajo Basin, spied a nice line up the north slope and began our climb of the prominent couloir about 2/3 of the way along the ridge from Mount Wilson. The new 3 to 4 inches of snow made for easy climbing sans crampons to begin with but we put our crampons on around 12,700' when the going got a bit steeper and the snow a bit harder. Bill did an awesome job of kicking steps up to just below the ridge crest where we stopped to snack a bit before getting on the ridge proper. 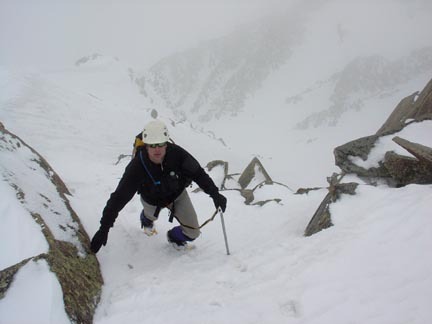 Bill reaching the top of our couloir climb on the north slopes of El Diente. The clouds and snow were still coming and going but we occasionally caught glimpses of the ridgeline but not the summits. As we reached the ridge and began traversing the ridge towards to El Diente I told Bill, "Watch, when we reach the summit the clouds are going to disappear and we'll have an awesome view!" We both laughed and carried on while we both no doubt hoped I was right. We traversed on good snow on the ridge's south side below the "Organ Pipes" and found a nice, short snow slot to take us to the ridge crest again. On the ridge below the "Organ Pipes" heading towards El Diente. Just as we were entering the slot, the clouds broke and we had the view! We could see the summits of El Diente, Mount Wilson, Gladstone and Wilson Peak as well as the Sleeping Ute Mountain down by Cortez. Along with this view, the sun's warmth was very welcomed! We did a bit of dodging obstacles on the ridge's north side and found ourselves on the summit shortly before 2pm. We had a great view of the traverse and it looked a bit daunting with the new snow covering the rock along the traverse. But the weather was clearing and our spirits were high. Bill stands on the summit of El Diente with the ridge to Mount Wilson in the background. A little after 2pm we began retracing our steps along the ridge and were back at the point we started the traverse in short order. From there we had a bit of hiking along the true ridge crest before dropping down to our right (south) to traverse some snow fields and bypass the large cliff face along the ridge crest. We found the snow to be quite soft (thanks to the sun coming out!) and made good progress through the snow and back up to the ridge crest. Bill stands on the ridge about halfway through the traverse from El Diente to Mount Wilson. From here it appeared we'd be spending a great deal of time on rock on the ridge crest so we packed up the crampons. For the next 30 minutes we enjoyed some exposed "ridge-running" along good, dry rock. The traverse was proving to be very exciting. We came to a low-point along the ridge where it looked like one could either go quite low onto the snow on the right side or do some easy scrambling up rock to the ridge crest again. From what I could remember we needed to go high. So we took in some fun rock scrambling to gain the ridge crest again and did some more exposed ridge-running to a point where we needed to down climb to snow. This was tedious but straight-forward and we soon kicked steps up through the last slot to gain the summit ridge to Mount Wilson. The terribly exposed fourth-class finish to Mount Wilson's summit always commands a great deal of attention! We reached the summit at 4:30pm--2 and a 1/2 hours after leaving the summit of El Diente. It was still partly cloudy but we had a great view of the entire ridge back to El Diente as well as a view of Lizardhead and Gladstone Peak. It was a beautiful evening. We signed the summit register, and best we could tell, we were the first summiters of the year. A few photos and we headed down to carefully reverse the fourth-class moves and descend back to camp. The descent back to camp was an enjoyable and easy plung-stepping fest down a couloir along Mount Wilson's northeast ridge. We were wishing for the snowboards at that point! We had to descend much lower than our camp, to about 12,000 feet, to score water at a small surface flow on the snow for the night and the next day before finally getting back to camp at 7pm. Dehydrated Jamaican BBQ Chicken with StrawberryCheesecake for dessert and we were sleeping at 9:15pm set for a 4:30am wake-up call to climb Wilson Peak with Dan. See that report here.